Many popular phrases on Wall Street are completely wrong and offer poor advice. One popular moniker that falls into this category is “the easy money has been made.” The only way it looks like easy money has been made is in hindsight. It’s easy to say the year to date gains were simple to obtain, but the reality is it was scary to buy stocks early in the year and in late 2018 even though they were cheap. During the shutdown there wasn’t much government economic data available. The data we had showed global developed market growth was slowing. It turns out that the American economy has been outperforming other developed markets, but this was an unknown 6 weeks ago. The proof that these profits weren’t easy money is the chart below. If you caught the Jan rally, but held during the Q4 downturn, you’re not ahead, but you’re ok. If you got caught in a Q4 downturn & sold at the bottom, you made a classic panic mistake. The TD Ameritrade investor movement index shows retail investors became more bearish in January as stocks rallied. The index fell from 4.41 to 4.28. This rally has been met with skepticism. On the other hand, just because retail investors aren’t euphoric, doesn’t mean stocks can’t pull back. Currently the 14 day RSI signals stocks are overbought as it is at 74.65. Anything above 70 signals stocks are overbought in the near term. To be clear, there is no sustainable way to make easy money. It’s possible to have a lucky trade where something you don’t predict ends up leading to profits. As we mentioned in a previous article, wage growth was revised higher in December which put it above rent inflation. Wage growth for production and non-supervisory workers, which make up 82% of the work force, was 3.5% in December which was the highest of this cycle. It fell to 3.4% in January but that’s still strong. It’s worth pointing out that including 82% of workers means the lower and middle class comprise this group. It’s not only minimum wage workers. 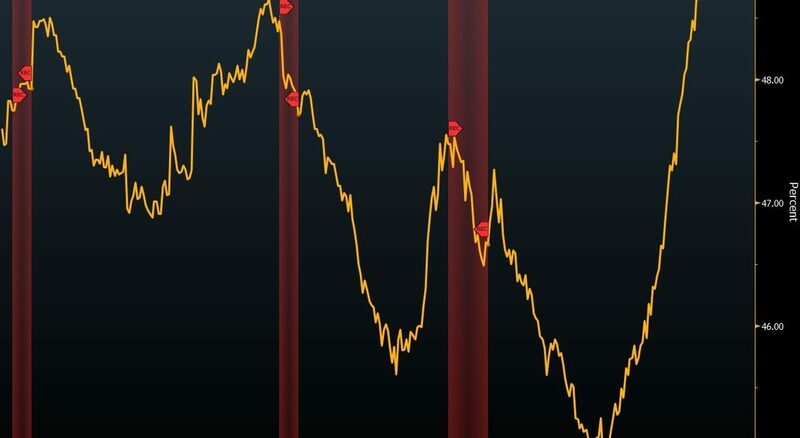 Lower wage workers have recently been doing well because the labor market is tightening. Workers at the bottom rung of companies are the easiest to fire because they are the easiest to replace. That makes their unemployment rate and wage growth the most volatile. December was great for workers in lower wage industries as their wage growth was about 4.5%. The middle and higher wage industries had about 3% wage growth. Since we are discussing wage growth in low wage industries, the restaurant industry is a great example to review. This sector has seen labor deleverage as workers are getting pay hikes quicker than sales are growing. Specifically, in the past 3 years labor costs have deleveraged 250 basis points. Labor costs were 30.1% of sales in late 2015 and they are expected to be 32.5% in late 2018. The chart below shows limited service (fast food) restaurant wage growth in a different way as it compares it to national average hourly pay. The ratio is above 49% which means these workers get slightly less than half the national average. That’s historically great as wages haven’t been this high in relation to national wages in over 19 years at least. A strong labor market with high real wage growth brings people off the sidelines. Employers are desperate for workers, so they lower hiring requirements. Workers who haven’t been in the labor market for a while or don’t have much experience get a chance. Workers with disabilities are also getting a chance. As you can see from the chart below, there has been a spike in terminations of Social Security disability benefits due to gainful employment from 2013 to 2017. It likely increased further in 2018. There is also the possibility some people on disability aren’t really disabled, so they get a job when opportunities are available. Both possibilities signal the labor market is filling up. We will get to the weakness in 2019 earnings estimates later in this article, but first it’s notable how great U.S. earnings growth has been in Q4 relative to the rest of the world even after you take away the benefits of the U.S. tax cut. The weakness in 2019 earnings estimates has been coming from firms with high international exposure. It’s clear the American economy is outperforming the rest of the developed world. As you can see from the chart below, blended S&P 500 revenue growth is 5.6%, while EAFE revenue growth is 4.6%. Blended results include estimates and actual reports. They are used because we are in the middle of Q4 earnings season. The EAFE is a developed global stock index that excludes firms in America and Canada. It stands for Europe, Australasia, and the Far East. As the chart shows, American earnings and EPS vastly outperform EAFE. US earnings and EPS growth is 4.9% and 7.1%, while EAFE’s are -7.2% and -7.5%. This explains why capital is pouring into US equities even though 2019 estimates have been falling. According to FactSet, Q1 S&P 500 earnings estimates expect a 0.8% decline. Q1 2019 had the largest decline in bottom up estimates in the first month of the quarter since Q1 2016. That was the epicenter of the last earnings recession. Q1 2019 estimates fell 4.3% in January and Q1 2016 estimates fell 5.5% in January 2016. If earnings season where to start now, we could see earnings growth because estimates are usually beaten. However, Q4 2018 earnings season isn’t over yet. We still have a couple months for Q1 2019 estimates to potentially fall. The chart below breaks down the sector changes in estimates since December 31st. The decline in oil prices shifted energy earnings estimates lower. Weakness in the rest of the world, specifically China has caused the tech sector’s estimates to decline. Only utilities saw their estimates increase. Retail investors missed out on the gains to start 2019. That wasn’t easy money. Every movement in stocks is difficult to forecast. The good news is it’s possible to have an incorrect thesis and still make money. That’s luck which is unsustainable. The labor market is strong, so production and non-supervisory workers are seeing strong wage growth. Fast food workers are seeing strong wage growth in relation to the rest of the labor market. The American economy is outperforming the rest of the world. That’s why ex-tax cut EPS growth in Q4 2018 surpassed that of the rest of the developed world. However, weak commodities prices and slowing global growth have helped push Q1 2019 estimates down sharply. We may see earnings fall even if you assume results beat estimates. 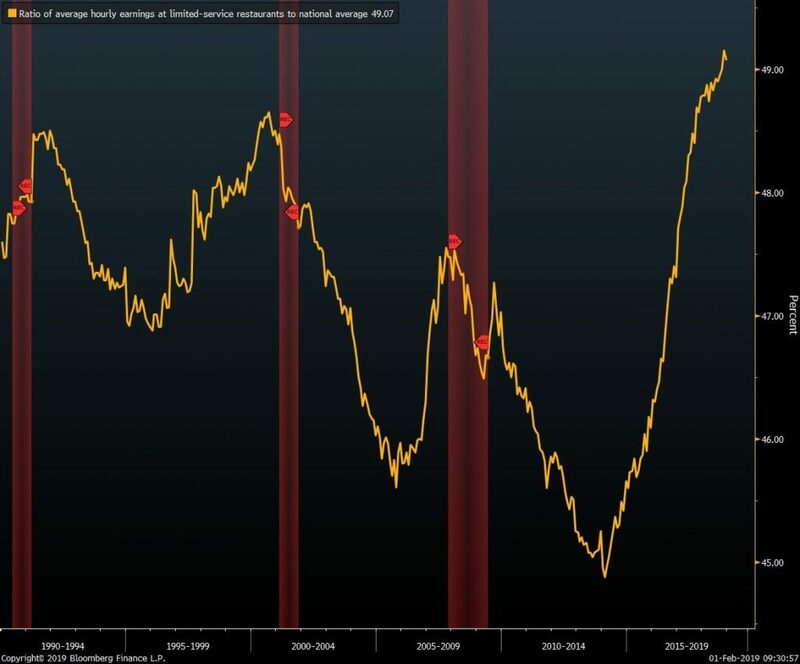 PreviousLabor Market Running Out Of Supply?